What a week! While BV prepped to hit Austin next week for SXSW, the music industry seemingly dropped three weeks worth of news, album and tour announcements, festival lineup and more on us over about three days. (Blogger problems, I know.) In addition to that it’s another big New Release Friday, and this week I review new albums from Norway’s I Was a King (remember them? ), Brooklyn minimal wave duo Xeno & Oaklander, and Montreal’s MUNYA. 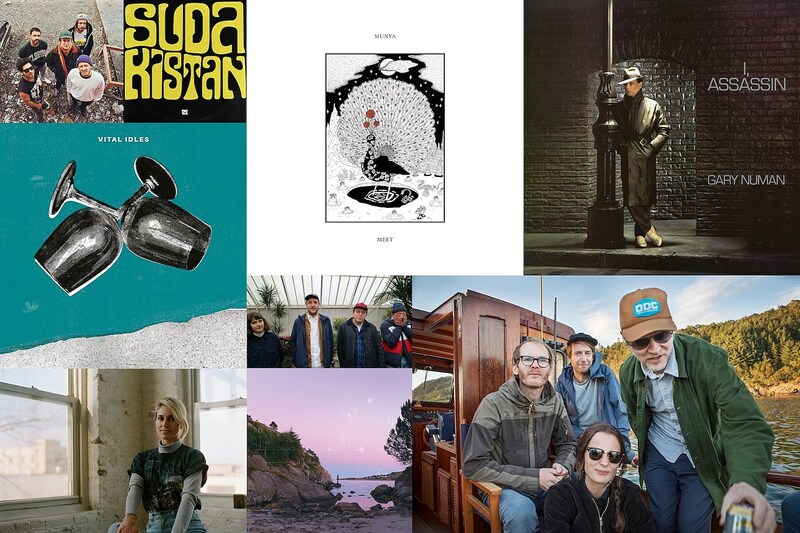 Plus: Scottish post-punks Vital Idles, a reissue of Gary Numan‘s fourth, fretless solo album I Assassin, and Sweden-via-South-America psych band Sudakistan cover The Stooges on their new single. Need more? Like I said, this week was a deluge of stuff: Versus are back; so are Pittsburgh’s The Gotobeds; so are Clinic; Protomartyr are finally reissuing their out-of-print first album; the reissue of The Fall’s Bend Sinister is out today; and there are a bunch of cool music-related films announced for the 2019 Tribeca Film Fest, including the Other Music documentary. Need more even more? Andrew reviews the new Meat Puppets and more in today’s Notable Releases of the Week. It’s been five years since we’ve heard from Norway’s I Was a King, and by that I mean their last record (2014’s Isle of Yours) which didn’t get a North American release (not even streaming) and I’m not sure I knew existed. That record found them heading in more of an expansive pop trajectory, but with this new album they’re back on the jangly terra firma of their previous albums (like 2009’s self-titled). Back them, IWAK got a lot of comparisons to Teenage Fanclub — which they all but admitted to with their single “Norman Bleik” — and now the inevitable has happened: they got the actual Norman Blake (of Teenage Fanclub) to produce their new album Slow Century. That’s kind of like getting New Order’s Bernard Sumner to produce a Cut Copy album, but for fans of harmony-laden Big Star-ish guitar pop, it’s two great tastes that taste great together. Like “Norman Bleik,” if you played new single “Bubble,” with its ringing chord intro, and told someone that it was a new ‘Fannies song, they might believe you at first, but Anne Lise Frøkedal and Frode Strømstad’s vocals have a different timbre to them. Regardless it’s a very catchy song, and the rest of the record shows more individual style, all with loads of hooks and bursts of distorted guitar intertwining with the sweet harmonies and choruses. Looking back for old posts about I Was a King reminded me that Frøkedal had another band, Harrys Gym, that I liked a lot. Whatever happened to them? Montreal artist Munya (real name Josie Boivi) released two EPs last year, one of which, Delmano, made my list of Best Extended Plays of 2018, and the other, North Hatley, was a close runner up. She’s back today with a third EP, Blue Pine, that offers up three more examples of her bewitching brand of pop. “Benjamin,” where she sings in both English and French, is my favorite of the three tracks, maybe because it’s the most Delmano-ish, with warbly synthesizers beamed in from a parallel universe, a great liquid bassline, and a Franco-pop style melody. The title track is delicate dreampop, closer to Cocteau Twins in a slightly R&B way, with cascading guitar lines twisting together with Munya’s gossamer vocals. Then there’s “It’s All About You,” which is very ’80s/’90s R&B pop, but still with that otherworldly production style (and just a little sitar for good measure) and Josie’s heavenly voice that goes a little Minnie Riperton at the end. Additionally, Blue Pine is joining with the two 2018 EP for one vinyl album that’s out today. The nine tracks are reordered for flow, opening with North Hatley’s “Des Bisous Partout” and closing with its title track instrumental and it all makes for a terrific, if still brief (29 minutes), listen. Munya just played NYC last night as part of the New Colossus Fest (I went, she was great) and she’ll be at SXSW next week. As Xeno & Oaklander, Sean McBride and Liz Wendelbo make synthpop the old fashioned way, using vintage analogue gear, step sequencers, patch cables, and no laptops….but maybe a Commodore Amiga. (It’s a lot like watching Vince Clarke demonstrate how to program a sequencer on ’80s PBS series Rock School.) On their fifth album and first for Dais, Hypnos, X&O do change things up a little, allowing polyphonic synths into their orbit after a few years of working only with monophonic synths. (Monophonic synths only play one note at a time, aka you can’t play chords.) “This has brought dense harmonies and a more complex counterpoint to the composition,” says McBride in the press release. “Staying with the same equipment and processes without the inveterate compulsion to update and refashion allows for a clearly perceivable genealogy with our previous work.” My thoughts exactly, Sean. It also warms up their sound to near the freezing point, even opening with a song called “Fire and Smoke.” (Then again, later on the album, they imagine a “World without Sun.”) The songwriting here is also very good, especially the spiraling “Angelique,” the sleek “Insomnia” and the frantic, rat-a-tat “Altamira.” Having done this for 15 years, Sean and Liz know how to get amazing sounds from their instruments and Hypnos is fantastically, methodically produced down to every bloop, blip, and ting, and benefits from being played loud. So turn it up. Speaking of superior minimal wave synthpop, there’s a new Automelodi album on the way. While mostly seen as a one hit wonder with “Cars” in the U.S., synthpop icon Gary Numan was a bonafide superstar in the UK from 1979 to 1983, racking up seven Top 10 hits (and many more that went Top 40), starting with Tubeway Army’s “Are Friends Electric” and going through “We Take Mystery (To Bed).” The latter is the closing track on his fourth solo album, 1982’s I Assassin, which was his final release for Beggars Banquet. It was just reissued on (green) vinyl by Beggars Arkive and finds him pretty far from “Cars” but is nonetheless a fascinating, occasionally great, record. Gary had cleaned house before 1981’s not very dancey Dance, having given up touring and ditching his band in favor of studio heavy hitters — Queen’s Roger Taylor, Japan’s Mick Karn — and ditching pop songs in favor of a spacey, more ambient sound. With I Assassin, he refines those ideas (and his fascination with old noir films and fashion) into something a little more palatable. This one is defined, without a doubt, by the sound of Pino Palladino‘s fretless bass, a liquid rubber sound that is all over I Assassin. (Having used Karn on Dances, Japan’s sound was clearly a big influence on Numan during this time.) The bass this time, though, is funkier, the pop hooks and “whoa-oh” choruses are back, and so are some of those big synths, as heard on “This is My House,” “Music for Chameleons” and the excellent “We Take Mystery to Bed.” The album is definitely a product of the early-’80s, but holds up pretty well (OK, maybe not the jazz pastiche of “The 1930’s Rust” or Gary’s fedora) and better than most of what he’d do after. Vital Idles new EP is out via Upset the Rhythm. Bonus Indie Basement points: Total Control’s Mikey Young mastered it. Sweden-based Latino garage-psych outfit take on The Stooges on new 7″…in Spanish! Sudakistan will be in Austin next week for SXSW including the Levitation party on 3/14.www.facebook.com/sudakistan for details on all their shows.